Orthodox Church liturgical Subdeacon clergy vestments (white-silver) by Istok Church Supplies Corp.
For understated elegance and gracefulness, choose one of Istok Church Supplies’ immaculately designed sub deacon vestments (White-Silver). Offering great comfort and durability, these vestments are worthy additions to your church vestments collection. A sub deacon’s liturgical vestments remind a congregation of his official position in the Orthodox clergy hierarchy and bestow upon him the responsibility of assisting in various church liturgical services. 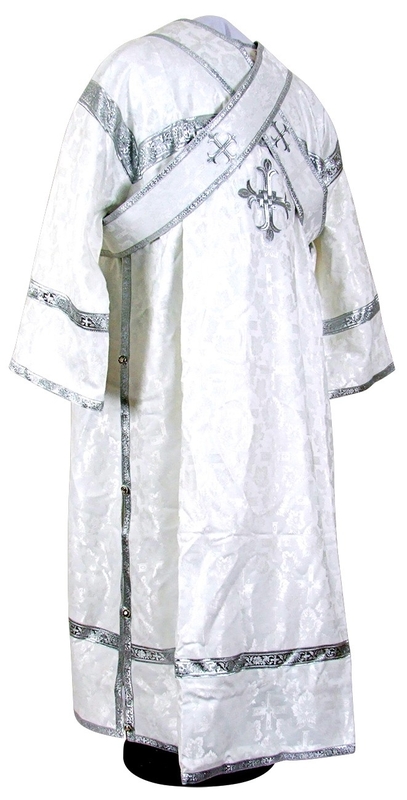 Our sub deacon vestments (White-Silver) are ideal for honoring the Most Holy Theotokos, Bodiless Powers and Virgins on important days dedicated to them. To ensure aesthetic appeal, we use only fine church brocade materials including rayon brocade and metallic brocade. Whether you’re looking for a sub deacon’s vestment with elegance or lavishness, you will find the most beautiful solutions in our collection. We are here to cater to all budgets and considerations. We offer many options for customization – from the fabric and type of decoration to upgrading your order with natural velvet inserts, you have plenty of choices to help you make the vestment reflect your tastes and requirements. Added to this is our stellar made-to-measure services, using which you can have a unique and perfectly fitting sub deacon’s vestment set. When you choose one of our church liturgical vestments, you receive unparalleled value for money. We offer our sub deacon vestments to churches and individuals alike. With Istok Church Supplies, you can quickly, easily and securely order custom sub deacon vestments for doorstep delivery from all over the world. Experienced and dedicated tailors with understanding of Orthodox Christian traditions construct every vestment from scratch. Due to our insistence on meticulous attention to detail, we require a few short weeks to ship each individual order. We aim for your complete satisfaction and gratification. We hope you enjoy our collection of high quality sub deacon vestments (White-Silver)!